Set on the western slopes of the Mendip Hills in the medieval city of Wells, there has been a sacred site beside springs of fresh water for over 1,000 years. The 12th Century Wells Cathedral has been attracting pilgrims and tourists to it’s hallowed grounds for centuries. It has been described as a masterpiece and is both a beautiful and historic centre of Christianity. 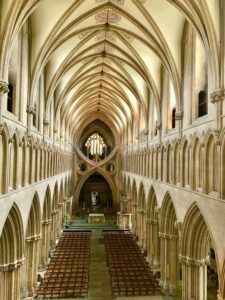 The re-introduced “High Parts” tour (we understand that these tours were run previously but discontinued) takes you beyond the beauty of the cathedral to walk in the footsteps of the Wells Cathedral masons. 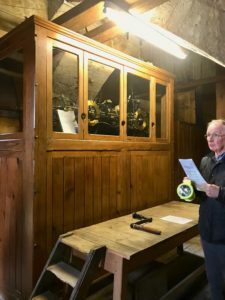 This behind-the-scenes tour (90 minutes in length) takes you up the steep spiral staircase to discover the hidden spaces, galleries and chambers – we even got behind the famous Wells clock! 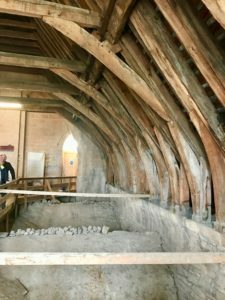 Our two knowledgeable tour guides – there are two guides on each tour – showed us the surviving tracing floors (there are only two surviving in the country, the other being at York Minster) where masons drew and practiced templates on the floor. 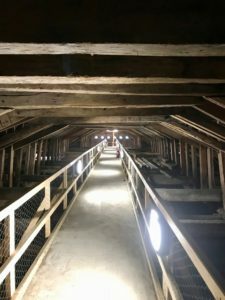 We walked along the singing gallery and learned about the trumpet holes (and were treated to the most glorious view of the inside of the cathedral), explored the south transept roof space and viewed the nave from a very different perspective! We couldn’t believe how quickly the time went and thoroughly enjoyed listening to the guides who brought the masons and the building of the cathedral, and re-building, to life for us. The tour is definitely worth taking and can be booked directly on the Cathedral’s website (there is an additional charge for this tour). Please do note – there are up to 250 steps, uneven floors, low ceilings and some narrow points to navigate through so anyone with a fear of heights or confined spaces and/or in poor health should really consider carefully their suitability for the tour. Groups of no more than 12 are permitted on any tour and children under the age of 10 are not permitted. Children between the ages of 10 and 16 must be accompanied by one adult for every two children. 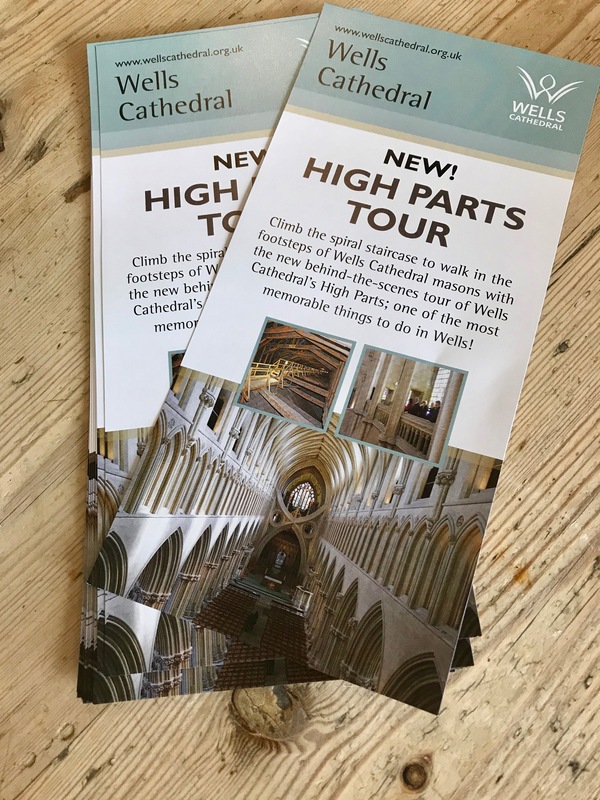 Wells Cathedral take their health and safety very seriously and a detailed safety information brochure will be given to each participant to read and then sign that they have understood. You can book the tour alone, a tour with tea/biscuits or a tour and cream tea – all options can be found on their website. If you love historic buildings, architecture or are just a fan of “Pillars of the Earth” you will find this tour fascinating. I will say that having taken the free cathedral tour previously helped me to understand some of the architectural lingo used by the guides so if you have time, do both! You won’t be disappointed!